People often say they like my pictures because they are so "natural" and "candid". However, there is actually a lot more to them that that! Natural and candid pictures can often result in an image which the client doesn't actually like of themselves - there is an art to making your pictures "look" natural and candid, but still keeping them professional and flattering. Obviously it depends on your subject. It is much easier to get successful candid shots of little children, as they tend to do their own thing and not look to you for direction, which means they can be playing and totally unaware of you as you shoot gorgeous pictures of them. 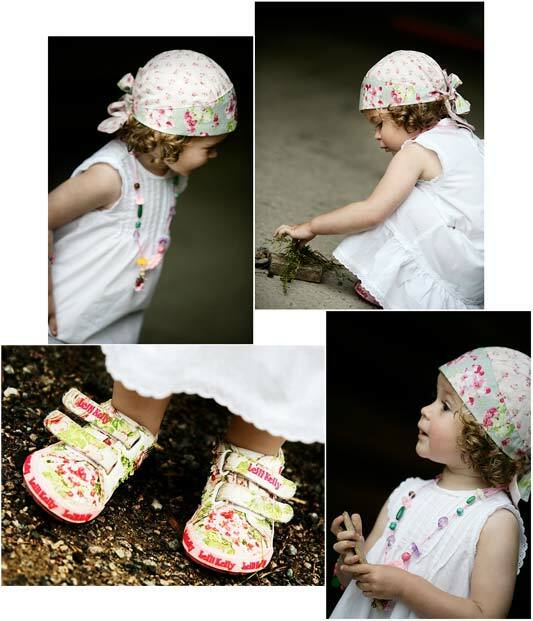 The pictures should usually look gorgeous because most under 5's just have to stand there to look cute - it's difficult to take a bad candid picture of a cute child who is playing happily! However, once you start to introduce adults to a picture, candid shots can look very unflattering. Most adults are very self conscious about themselves and will look to you for direction and reassurance. You need to create shots which look candid, but have actually been very well thought through. In the beach shot, where the mum is running with her four children, this feels very natural and candid, but has been carefully set up to create this mood. If I just followed her around with her children shooting candidly, this shot would never have been achieved, because more than likely one of the children would have run in front of another, and obscured their face, and it is unlikely the mum would have been running around the beach without being asked to! So for this shot, I asked the mum to hold hands with all the children, deliberately placing the youngest between her and the oldest for support. I then asked them all to stand in a row on the other side of the pool of water, and then told them to run towards me when I shouted "1,2, 3 Go!" By starting them off in a line, holding hands I am ensuring that don't run in front of each other, and spoil the shot. I have also made sure they are all wearing complementary clothes which don't detract from the soft, neutral background. I have chosen the background deliberately because it has nothing distracting in it, and I am shooting into the sun so the children aren't squinting. So, although this shot looks candid, a great deal of thought has gone into making it like this. Having decided on the background, lighting, clothes and positioning, I can then then shoot "candidly" as they run towards me, several times! 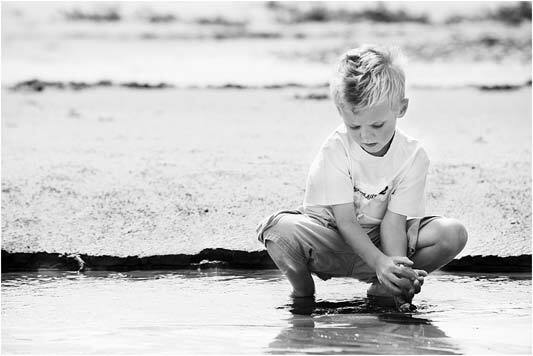 In the shot of the boy on the beach, he is playing happily with the sand, while I shoot. But I have asked him to play so that the sun is behind him, resulting in flattering images without the sun making him squint. I have also spent a lot of time prior to shooting, developing a relationship with the people so that we are all having a great time together. They feel relaxed and are having fun, because we've got to know each other over coffee, and I've been playing with the children on the beach. Otherwise they may feel silly and not want to do what I am asking them. In the shot of the little girl in the white dress, I have been able to take lots of natural shots while she plays, but I have asked her to play in the "right" light and in an environment where I can contain her for 5 minutes before she gets bored! We are in a shed, making a "cake" from bits of wood and leaves. I have asked her to stir up the "cake" with a piece of wood while her mum keeps finding bits and pieces to add to her cake. This keeps the child in one place, and totally absorbed in doing something, so she does not think she is being photographed, while I can wander around shooting her from different angles as she plays. Again I have chosen clothes which she would look cute in whatever she was doing, and the background is out of focus and therefore unobtrusive. So the more you can organise your shot beforehand, the more flattering your "candid" shots can be! If you want to take truly natural shots, then you will need to be well out of sight of your subject, and in this case you cannot offer any direction, so will need to set the scene where the background and light will suit every shot, and then just see what happens. 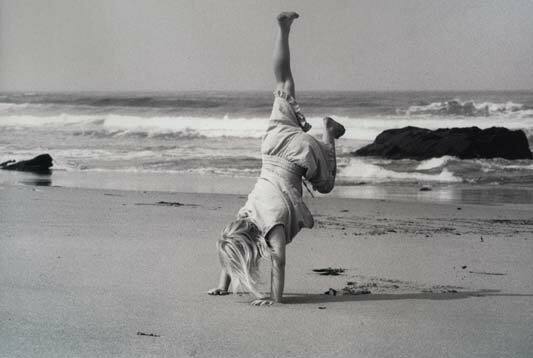 I took these photos many years ago of my daughter playing on a beach, whilst I was hiding behind a rock! Simply because being my own child, she just refused to be photographed! Annabel Williams' reputation as both a world class photographer and an outstanding tutor is recognised across the globe. Her warm enthusiasm, coupled with an incredibly intuitive approach, is and always has been the driving force behind her very personal and unique style of innovative yet contemporary award winning portraiture. She brings to her work an imagination and insight which is rare among even the finest professionals, all of which has contributed to her outstanding performance in her genre and it is these qualities which command Annabel so much respect from her peers. No stranger to both TV and the press, Annabel is also the author of several books on her subject. Her passionate viewpoint engages everyone in a highly enthusiastic exchange of ideas and creativity. Alongside her business partner Catherine Connor, Annabel also runs Contemporary Photographic Training (CPT) – a dedicated training centre in the Lake District, which runs a comprehensive range of workshops and seminars from ‘getting started’ right through to the prestigious ‘Bespoke Programme’ for aspiring professionals.